Atmasphere headliner, Sasha: @djsashaofficial needs no introduction. He is one of the penultimate legends of electronica. Grammy Award Nominee, Four-time DJ Mag Number 1 DJ in the world, one of the most illustrious list of venues & festivals under his belt, and a godfather of the dance music scene. After a four year hiatus, Sasha returned in 2015 with new productions, compilations, world tours, and sold out label show cases, and his already prosperous career re-exploded. He continues to be a global phenomenon, the ultimate timeless artist, still enlisting new fans and appealing to the next generation. @djsashaofficial descends upon India every five years, always choosing the hottest scenes to showcase his latest work, and this time around its none other than #SulaFest2019! Diatonik is one of India's globe trotting DJs. His escapades have taken him across the entire country, and across the world, where he has performed in over 30 countries in the last seven years. His repertoire includes many of the best venues & festivals in India, and a dazzling selection of cutting edge clubs & festivals all over Northern Europe, the Mediterranean, South-east Asia, and more. Diatonik is also developing into a producer to reckon with, releasing in labels such as Jannowitz, Ballroom, Prisma Techno, and Baroque Records, and includes great solo productions as well as collaboration with solid artists such as Maksim Dark and more... With more exciting collaborations and hotly tipped releases on the way, the journey has only just begun, so make sure you catch Diatonik at #SulaFest2019! Sashanti: is a man of many talents; DJ, curator, and promoter of house & techno music. A very experienced DJ who has played all over India, Russia, and Europe in many of the most cutting edge clubs, festivals, and private parties. Sashanti is also instrumental in the organisation behind many successful ventures in Goa, India. For many years he ran the prolific beach club: Shanti Goa, being one of the first people to support techno music in the area. Currently he is one of the founding partners of Soma Project, again one of Goa's most cutting edge house & techno concepts, for which he also curates a Soma showcase at ADE every year. Sashanti is an underground electronic music ambassador, constantly pushing the party to the next level with his music, with his organisation, and with his hard work & passion. Make sure you catch him at #SulaFest2019! Ankytrixx is definitely one of the highest flying DJs from the Indian house & techno scene. His web of music spans all the dance floor hubs of the country; from the big city scene, to smaller cities discovering themselves, up to the hills, and down onto the beach fronts. Across Europe his web continues to grow in many iconic electronic music hotbeds like Amsterdam, Berlin, Barcelona, and Ibiza. A prolific DJ, producer, and curator, Ankytrixx floats effortlessly yet passionately through all the different facets of the underground electronic dance music culture, winning hearts & feet as he forges sets, releases music, designs lineups, and collaborates with wizards. 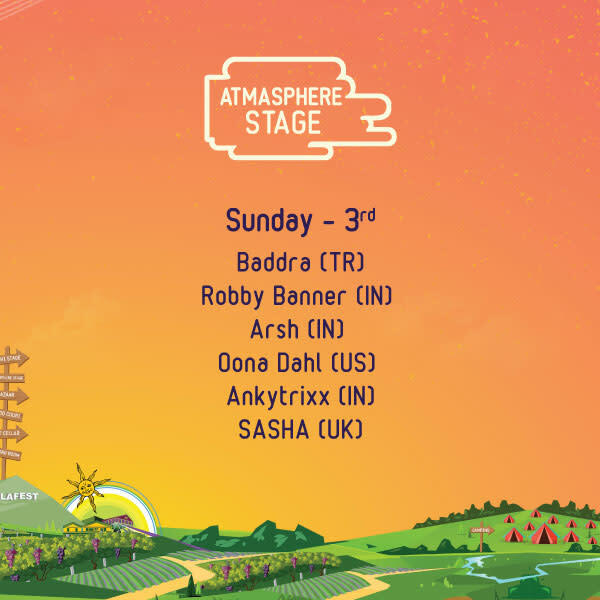 Make sure you are at #SulaFest2019 when Ankytrixx floats on through the Atmasphere stage! Nikhil Chinapa: is one of the foundational names in the electronic music industry of India. After co-founding the illustrious Submerge, he was the Co-founder of and is the curator of some of India's biggest electronic music festivals. All these years immersed in the scene also brought out the DJ in Nikhil, who has developed himself into a groovy, happy, energetic spinner of webs of house & techno. His deep understanding of all the facets of the electronic music world and his love for music has made him into a pleasantly formidable force behind the decks. We are very excited to host him at #SulaFest2019...but wait, there is more! As most of you probably know that Nikhil was also a VJ for MTV for more than 10 years, and is also a national sensation on the TV show Roadies. As you can see, Nikhil is the collision of various different worlds, so make sure you collide with him at #SulaFest2019! Juliet Fox: We are proud to bring you one of the rising stars of the global techno scene for #SulaFest2019! @djjulietfox rise in the industry already has heads turning with her countless production successes, collaborations with heavyweights like Ramiro Lopez, and her sensational collaboration with India's own Arjun Vagale, released on Odd Recordings, which has been supported with the likes of Sam Paganini, Pan-Pot, and Alan Fitzpatrick. Her label affiliations include the mighty Drum Code, Odd Recordings, Toolroom, and Suarez. Do not miss her at #SulaFest2019 as it gets included on her global rampage. Oona Dahl: We are very happy to bring you the sound-sorceress: @oonadahl for #SulaFest2019. Affiliated with top labels like Anjuna Deep, and All Day I Dream, Igloo Records, and Stripped Recordings, her original productions span broad dance floor territory from Techno, Deep House, to Experimental Electronica. Finding the balance between light & dark is her mission as she channels sound waves from other dimensions and swirls dance floors with spirit and casts hypnotic spells from beyond. Don't miss the magic! Nothing Anonymous is a fresh artist duo from Mumbai, signed under Krunk, one of India's most cutting edge labels for independent music. Their live-electronic style incorporates broken beats & vocal melodies. Dreamy, groovy, and sublime is the name of their game, and they are already turning heads wherever they perform, including on some of the other big festival stages in the country. 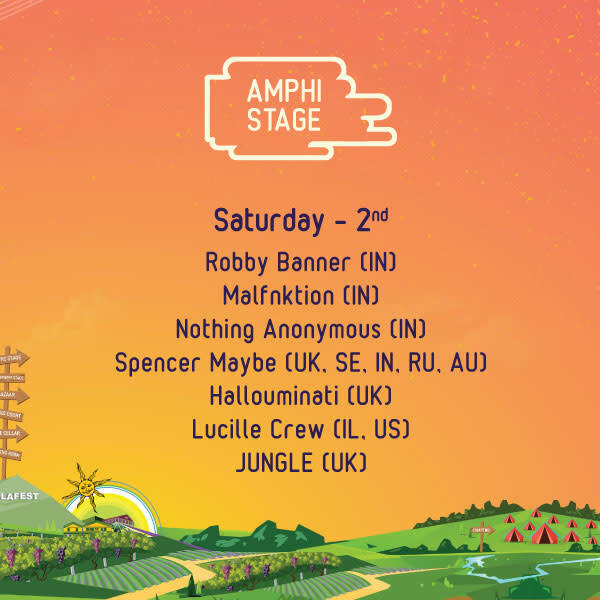 Get ready to #discover Nothing Anonymous at #SulaFest2019. 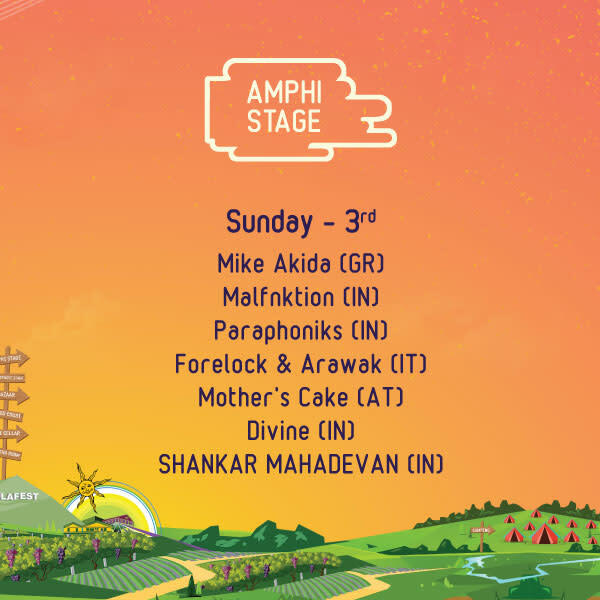 Malfnktion: Every year at #SulaFest we present an artist who becomes a regular feature of the Amphitheater stage through both days of the festival, giving us short power-packed dynamic performances between each of the bands. 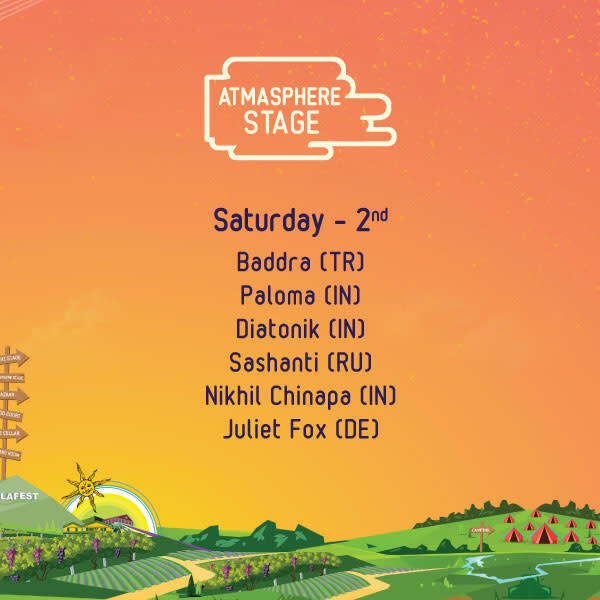 For #SulaFest2019 this act is @malfnktion. An electronic music project influence heavily by Hip-Hop & Bass, and is known for combining rap, up-beat rhythms with ethnic sounds & samples that are collected from all over the country, as well as from Indian film music. @malfnktion will be featuring special guests during his performances over the two days, hosting different rappers & lyricists to weave in and out of his hip-hop & bass infused wizardry. Beware of @malfnktion because he is going take over your memories! Paraphoniks is a Bombay-based electronic music duo. Inspired by many musical genres, they tie their varied influences together by a shared love of modular synthesizers and other electronic instruments. They combine the immediacy and often unpredictable nature of these electronic weapons, with more conventional instruments such as guitars, keyboards, and drums. Catch them live at #SulaFest2019 and #discover their unique approach to both making music and live performance. Forelock and Arawack: It's no secret that we love Reggae, so the team at #SulaFest2019 cannot call this festival complete without having you #discover Forelock & Arawak Reggae! These super-chill, groovy reggae masters, all the way from Italy, are going to bless us all in the sunshine with their positive vibes and and uplifting tunes. Shankar (headliner india): It’s time to announce our Indian superstar: @shankar.mahadevan! This national icon will be bringing us his renowned project "My Country My Music". A colorful journey through the multifaceted worlds of Indian genres & folk music across this rich and diverse country. In addition to providing vocals for the world famous band 'Shakti', which included maestros like Zakir Hussain & John McLaughlin, and forming the sensational trio, 'Shankar Ehsaan & Loy'. @shankar.mahadevan is also a national award winning Bollywood music composer who has scored for over 40 films, winning him over 20 awards. You can be sure that the musical journey he paints for us at #SulaFest2019 will also include some of the Bollywood aspects of the multidimensional Indian music landscape. Lets #celebrate one of India's greatest! Hallouminati: Gypsy. Balkan. Electro. Ska. Swing. Punk. Do you want the definition of mash-up? The answer is: #hallouminati, and we at #SulaFest2019 are thrilled to introduce you to this UK based gang of cruisers. This refreshing, high energy, super-grooved-out band from the respectable Batov Records, will be flying in with a lot of soul and flying out with your heart. #BePrepared to #Discover#hallouminati! Divine: #SulaFest2019 is proud to bring you India's biggest Hip-Hop artist! @vivianakadivine is an award-winning rapper from Mumbai. Born and brought up in the ‘gullies’ of the city, DIVINE has come to be known as ‘the Voice of the Streets’ - paying homage to the characteristics of the metropolis. DIVINE has grown and conquered; in 2013 his song "Yeh Mera Bombay" went viral and spread through local stations nationally, reached all the way to the BBC Asia network. In 2015 "Mere Gully Mein" Won Rolling Stone's *Best Music Video*, and later in the year he was awarded *Best New Artist* in India by iTunes & Apple Music. Coming soon in 2019; a feature film about DIVINE, called "Gully Boy", starring Ranveer Singh as DIVINE, will be releasing in theatres all over India! As the #journey continues, so will his lyrics. Catch this #IndianSensation at #SulaFest2019! Mother’s Cake: This award winning Rock band has been raging shows around the globe since 2008. They recently toured with Alice in Chains as their support act, and have also supported the Deftones and many other incredible bands. Hailing from Austria, Mother's Cake is all set to command the Sula stage with their unique brand of funked-up-electro-psychedelic-power-rock. Are you ready to roll?! #makeway & #discover, @motherscakemusic! Lucille Crew: #SulaFest2019 introduces you to @lucillecrew, an international HipHop, Funk & Soul collective, fronted by Baltimore native MC Rebel Sun, and Argentinian producer & guitarist Izzy after he started a studio project with Yoram Vazan, the sound engineer for Wu Tang Clan and Mos Def. Based out of Tel Aviv, and supported with a crew of maestro musicians from the vivid indie scene in Israel, this band is gonna blow your socks of with their Old School HipHop blended with shades of funk, soul, and pumped up with the crazy Balkan horns and energy. Its time to #makeway & #discover: @lucillecrew! Jungle: We are very excited to announce the #SulaFest2019 Headliner : @jungle4eva. For the first time in India, the British soul & funk sensation will also be blessing us with their new album 'For Ever'. No strangers to the UK Top 10 and various other accolades; they are currently one of the hottest bands on the global touring stage & premiere festival circuit, feverishly circling the world with back to back concerts. Some of the biggest festivals in India have been trying to get the Jungle experience, so we at #SulaFest are proud to be the ones bringing you this super hot band for a single exclusive show in India! Curated by #RaMusic. 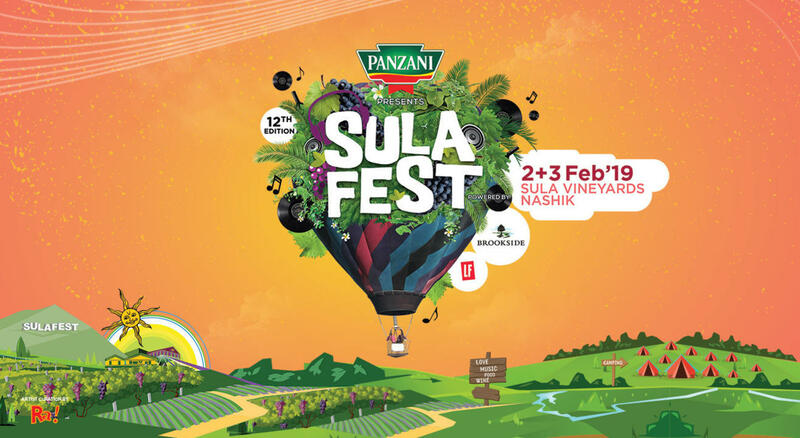 Sulafest 2019 The country’s most gorgeously situated eagerly awaited GOURMET music festival is back in its 12th edition on February 2nd & 3rd and it’s bigger and better than ever before! Ever wondered how it'd be to spend the night under the sparkling gaze of the stars of the night sky? Breathing in the natural air, surrounded by lush green vineyards? Well, no need to look any further. SulaFest '19 brings to you the very popular 'Tent City' accommodation where the thrill and excitement of camping can be experienced. The country’s most gorgeously situated eagerly awaited GOURMET music festival is back in its 12th edition on February 2nd 3rd and it’s bigger and better than ever before! Breathing in the natural air, surrounded by lush green vineyards? Well, no need to look any further. SulaFest 2019 brings to you the very popular 'Tent City' accommodation where the thrill and excitement of camping can be experienced. This year is bigger and better you have four Options to choose from Camping, Glamping . What's more! There will be a barbeque at additional cost for the cool evenings and breakfast for the bright mornings! Can't believe? Well, then you need to see to do… Come and experience the lovely ‘Tent City’ this SulaFest! For more details refer to contact us page. Limited Seats.Entry on First come.First Pay basis. This ticket entitles you to access to Campsite only on Twin sharing basis. NO MEALS provided. Ground mattress and Pillow with light Blankets. Jam Up Session at Night. Play area for outdoor games. Mingle with like-minded people by campfire. Extra Blanket or Personal Sleeping Bag - It will be cold we are just sleeping next to a lake! Please carry the printout of this receipt and an identity proof in order to enter The Tent city. No entry will be granted without a valid printout and an identity proof.